"The Lumi Experiment was founded in 2007 in Helsinki, Finland. The first EP was released in November 2010 and the song "Drunk By Noon" got a lot of international radioplay and it featured in multiple tv-productions and short films. "Drunk By Noon" peaked 2nd place on national ReverbNation charts in July 2010. 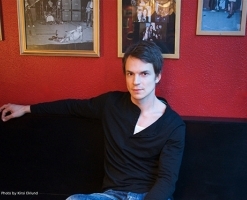 The first full-lenght album "Helsinki Minute" will be released in November 2011 with ten new and fresh sounding songs. The opening track of the album "Blackout In A Hallway" is out now!!!" I´ve always been a big fan of David Lynch so I would say Lost Highway and I would naturally play Fred Madisons role. That would be awesome. I´d play funky tunes from the 70´s on my Phat Sound 1979 -station. I guess one should have persistence and strong belief in his own thing. Some creativeness wouldn´t cause any harm either. They´ve heard every version of every song a thousand times during the writing process so I guess by the time the tunes are ready, they are already sick of them. At least I am! But seriously, their support is very important and I appreciate it a lot. My first gig was back in junior high. I don´t remember being nervous, I was just like "Wow! This is greatest thing ever!". I felt like a rock star when the audience was singing along (we played some well-known cover songs) and supporting their friends who couldn´t play too well. Ah, nice memories! A fascinating post is worth comment.